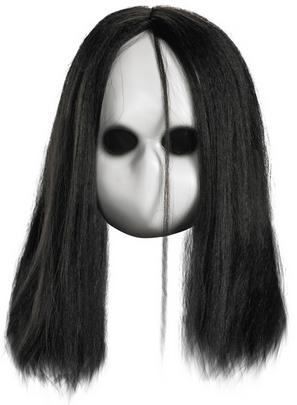 This small facemask features a shaded blank white face with black eyes. It covers a smaller adult or child face with black fabric covering the eyes so you can see out - but your opponents can't see in. MUAHAHAHA. Fits over the head with a horrifying elastic strap. Wig sold separately, people.